Identifying skills for the workplace. Evaluating personal qualities and skills e.g assertiveness. Evaluating personal qualities and skills e.g. decision-making. Evaluating personal qualities and skills e.g. resilience. Identifying job and career families. Exploring job and career families. Exploring different types of work: employment, self-employment, voluntary etc. Comparing attributes of education and employment. Access to our careers advisor. Access to our careers library. Identifying and exploring the job market and current trends within the job market. Knowing how the job market and changing job market will affect personal choices Post 16 and Post 18. Drafting and writing an initial education or career plan. Identifying the knowledge, skills and qualities that employers want (linked to plan). Knowing employer and employee rights and responsibilities in the workplace. Knowing key vocabulary and terms in the world of work. Drafting and writing a CV, covering letter and application form (Year 10 only). Knowing the benefits of work experience and planning work experience (Year 10 only). 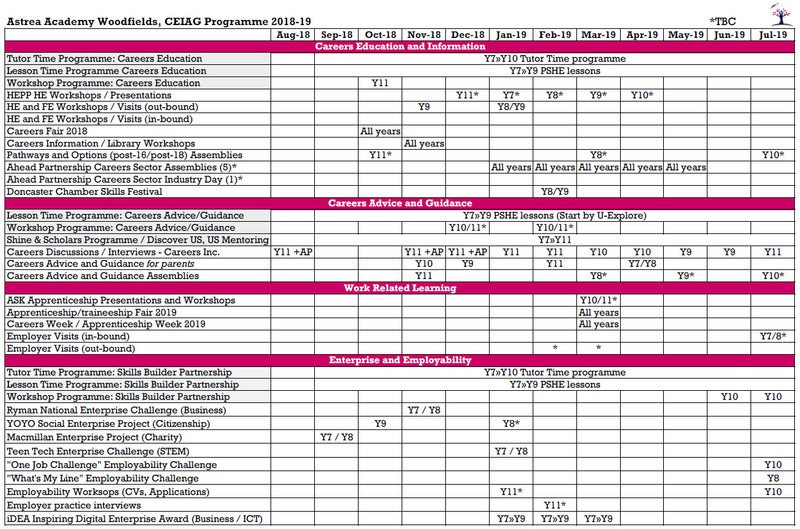 Click the image below to enlarge the Careers Programme or click here to download a PDF version.